Lady Gaga has pretty much been on top of the world since hitting it big with "Just Dance" in 2008, but it hasn't been an easy ride for the eccentric songbird. The singer, born Stefani Joanne Germanotta, seems much more of a tortured artist than a pop queen. Behind the crazy costumes and booming voice, Gaga has suffered everything from high-profile breakups, to debilitating physical pain, to the trauma associated with a harrowing sexual assault in her youth. Mother Monster had to overcome a lot before she topped the charts and changed the music world forever, and she's made a mission of raising awareness of all of the issues that she's had to conquer. Here are just some of the tragic things we've learned about the A Star Is Born superstar's struggles with fame and beyond — and how she's coped with them and helped others along the way. Lady Gaga revealed in June 2010 that she had a family history of lupus and that tests had her as "borderline positive" for the disease, despite the fact that she wasn't showing any active symptoms in the time. Gaga explained (via CNN), "Lupus is in my family, and it is genetic. And it's so funny because my mother told me the other day that my fans were quite worried about me because they did talk about the fact that I was tested for lupus. … So as of right now … I do not have it. But I have to take good care of myself." Symptoms of lupus, an autoimmune disease, can include fatigue, a low fever, joint pain, swelling, rashes, hair loss, and inflammation, but the illness can lie dormant for years with no symptoms at all. 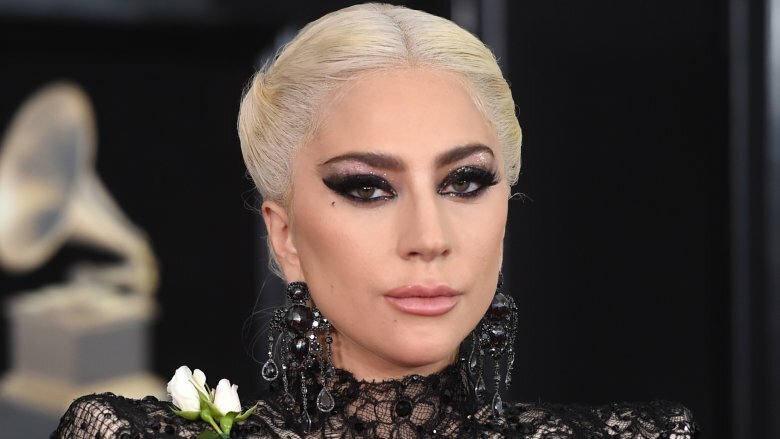 Experts told CNN that Gaga's test results are common for those who have a relative with lupus, but that it's possible (and hopeful) that she may never actually develop the disease. Lady Gaga revealed to Howard Stern in 2014 (via Billboard) that she was sexually assaulted by a music producer when she was a teenager. A year later, she expounded on the trauma she'd suffered, telling press (via Us Weekly), "I didn't tell anyone for, I think, seven years. I didn't know how to think about it. I didn't know how to accept it. I didn't know how not to blame myself, or think it was my fault. It was something that really changed my life. It changed who I was completely." Gaga channeled her trauma for "Til It Happens To You," a song she co-wrote with Dianne Warren, about surviving sexual assault for the 2015 film The Hunting Ground. She explained to The Los Angeles Times that the song's acclaim was bittersweet for her. "Every time I listen to it, I cry," she said. "Every time I get a text about it, I always feel sick. It's like this thing you don't want to face." Lady Gaga collaborated with R. Kelly in 2013 for "Do What U Want (With My Body)," and the disturbing music video for the track — directed by Terry Richardson, who was accused of sexual misconduct — was scrapped before its release. Kelly was famously accused for years of sexual misconduct and sexual assault. 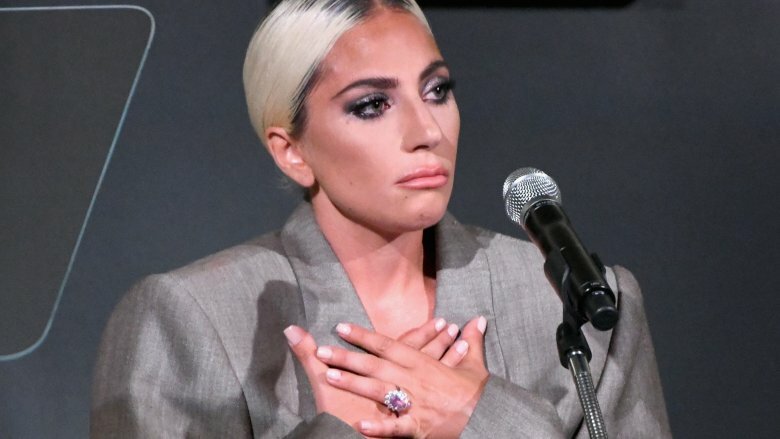 After the Surviving R. Kelly docuseries aired on Lifetime in early 2019, many called for Gaga to address working with the alleged predator while being an advocate for sexual assault survivors. She finally revealed what her motive was in a tweet, writing, in part, "I stand behind these women 1000%, believe them, know they are suffering and in pain, and feel strongly that their voices should be heard and taken seriously. What I'm hearing about the allegations against R. Kelly is absolutely horrifying and indefensible." She continued, "As a victim of sexual assault myself, I made both the song and video at a dark time in my life, my intention was to create something extremely defiant and provocative because I was angry and still hadn't processed the trauma that had occurred in my own life. … I think it's clear how explicitly twisted my thinking was at the time." She apologized to the world and removed the song from streaming services. Lady Gaga has suffered from mental illness as a result of her traumatic sexual assault. She first revealed her struggle with post-traumatic stress disorder (PTSD) on the Today show in 2016, but opened up about it further in 2018 in a speech at the SAG-AFTRA Foundation's Patron of the Artists Awards. "I began to notice that I would stare off into space and black out for seconds or minutes. I would see flashes of things I was tormented by, experiences that were filed away in my brain with 'I'll deal with you later' for many years because my brain was protecting me, as science teaches us," Gaga said in her speech (via Variety). "These were also symptoms of disassociation and PTSD and I did not have a team that included mental health support." She added that the condition "later morphed into physical chronic pain, fibromyalgia, panic attacks, acute trauma responses and debilitating mental spirals that have included suicidal ideation and masochistic behavior." Gaga's struggles with mental health led her to launch her Born This Way Foundation, and she also spoke out about mental health awareness at the 2019 Grammys. A big takeaway from the 2017 documentary Lady Gaga: Five Foot Two was the singer's struggle with chronic pain due to fibromyalgia. According to CNN, complications from condition led to Gaga either postponing or cancelling tour dates in 2017 and 2018. Fibromyalgia is a chronic condition with symptoms including nerve and muscle pain, trouble sleeping, headaches, face and jaw pain, digestive issues and fatigue, according to the Center for Disease Control and Prevention, as well as mental distress, trouble concentrating, and memory problems. While its causes aren't known, fibromyalgia has been loosely linked to PTSD, and is said to often "co-occur" with lupus , both of which Gaga has publicly battled. Gaga opened up about her condition further to Vogue in October 2018, explaining, "I get so irritated with people who don't believe fibromyalgia is real. … It's really a cyclone of anxiety, depression, PTSD, trauma, and panic disorder, all of which sends the nervous system into overdrive, and then you have nerve pain as a result. … Chronic pain is no joke. And it's every day waking up not knowing how you're going to feel." Thankfully, at the time of the Vogue interview, Gaga was on the mend: "It's getting better every day, because now I have fantastic doctors who take care of me and are getting me show-ready." Lady Gaga's traumas from her early life — from her health struggles to her sexual assault — bear an uncanny parallel to those suffered by her late aunt, Joanne Germanotta, who inspired her 2016 album Joanne. Gaga revealed at the Producers Guild Awards in January 2016 when she performed "Til It Happens To You," "[Sexual assault is] not only an important issue to me, but it's an important issue to my family because when my father's sister was in college, she was sexually assaulted. Then it tormented her so emotionally that it caused the lupus that she had to get so bad that she died. My father was 16, and it affected my family really tremendously my whole life. That's one of the centerpieces of our family." Speaking with V Magazine in August 2017, Gaga claimed her aunt Joanne, who she described as "a painter … a writer and a poet," died from the disease in 1974 — although at the time, her cause of death was unexplained. Towards the end of her life, Joanne's symptoms were so severe that doctors contemplated amputating her hands. 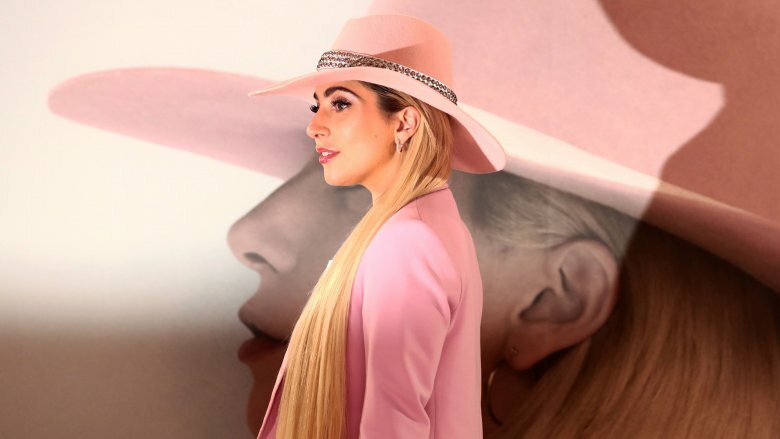 Describing Joanne's passing as "the center of the pain in my family," Gaga said that the tragedy is the reason "[she] must live every day as if it was [her] last." In her documentary, Lady Gaga: Five Foot Two (2017), Gaga lamented (via People), "My love life has just imploded. I sold 10 million [records] and lost Matt. I sold 30 million and lost Luc. I did a movie and lose Taylor. It's like a turnover." Gaga was referring to ex-boyfriends Matthew Michael Williams and Luc Carl, and ex-fiance Taylor Kinney (pictured above). Carl confessed in a 2012 interview with Blackbook (via PopCrush), "I'm not the type of guy who can sit on someone else's yacht sipping champagne. Unfortunately, to date someone who is never in the same country, let alone zip code, you had better be rich or be willing to live off of their money. I was neither." As for Kinney, Gaga's career was often cited as the main obstacle of their broken engagement. Gaga was somewhat vague herself when asked about the split, telling CBS This Morning (via Page Six) in 2016, "I think women love very hard. … Sometimes I don't know that that love is met with the type of dignity that we wish it would be met with. You know, we're not trying to make you less of a man. We just want you to love us as deeply and as wholesomely and as fully as we love you." Don't cry for Gaga too much, though: As of this writing, she's happily engaged to Christian Carino. As a result of her demons, Lady Gaga turned to self-medicating. In November 2013, Gaga admitted that she was addicted to marijuana, telling The Elvis Duran Z100 Morning Show (via Yahoo! ), "I was smoking up to 15, 20 marijuana cigarettes a day with no tobacco. I was living on a totally other psychedelic plane, numbing myself completely. … I had to stop." She also told the radio show how she then went "from substance to substance," experimenting "heavily over the past seven years." Her substance abuse was especially bad during her Born This Way Ball tour, during which she suffered a debilitating hip injury that forced her to scrap most of the dates. "I was just in a lot of pain and really depressed all the time and not really sure why," Gaga confessed, adding that she "did a lot of drugs and took a lot of pills" to cope. She also admitted in a 2011 interview with Howard Stern (via EW) that she suffered from cocaine addiction before she hit it big. "I did it all alone in my apartment while I wrote music," she said. "And you know what? I regret every line I ever did. … Don't touch it. It's the devil." 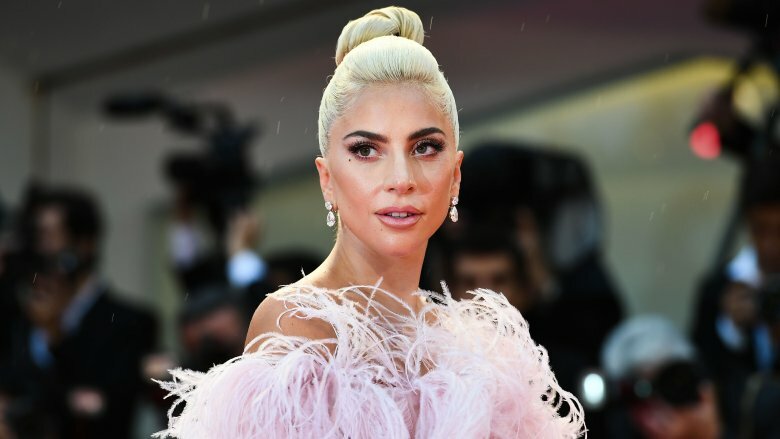 Gaga echoed the sentiment a year later when promoting A Star Is Born (2018), revealing to The Los Angeles Times that substance abuse can be an all-too-easy remedy for entertainers who also feel the same void. "It's very lonely being a performer. There's a certain loneliness that I feel, anyway — that I'm the only one that does what I do," she said. "So, it feels like no one understands. And the urge to use is because you're searching for a way to quell the pain." Lady Gaga revealed in February 2012 that she battled the eating disorders bulimia and anorexia since she was 15 years old. "I used to throw up all the time in high school. … I wanted to be a skinny little ballerina but I was a voluptuous little Italian girl whose dad had meatballs on the table every night," she said, according to Page Six. "It's really hard, but … you've got to talk to somebody about it." Gaga admitted that her bulimia was so severe that it did a number on her voice, explaining, "The [stomach] acid [from vomiting] on your vocal cords — it's very bad. But for those of you who don't sing, you maybe don't have that excuse until it's too late. It's very dangerous." Later that year, Gaga launched the "Body Revolution" page on her Little Monsters website (via The Hollywood Reporter). In an effort to "inspire bravery," she posted "un-retouched photos of herself in bra and underwear and a message about her past struggles with eating disorders". After her fans followed her lead, posting revealing images of themselves and detailing their own struggles with body image, Gaga thanked them for helping her "create a safe space online for people to be compassionate." In a note to those fans (via Rolling Stone), she wrote, "My weight/loss/gain since I was child has tormented me. No amount of help has ever healed my pain about it. But YOU have." Lady Gaga's emotional performance as Ally in A Star Is Born was partially inspired by real-life tragedy. One of Gaga's best friends, Sonja Durham, died after a long battle with cancer while Gaga was on set in May 2017 for the award-winning 2018 remake. She told Zane Lowe For Apple Music that the final scene of the movie was particularly difficult to shoot due to the heartbreaking timing. "On that day … her friend called me and I could hear [Durham] moaning in the background and she said she's not doing well," Gaga said. So, she "left the set" without even telling co-star and director Bradley Cooper where she was going, but she missed seeing her friend alive for the last time by just 10 minutes. After spending time with Durham's family, Gaga recalled, "[Her husband] said, 'You've gotta do what Sonja would want you to do.' She loved being a performer, and she loved working in music. She gave me a tragic gift that day and I took it with me when I went back to set, and I sang that song for Jackson [Maine] and for her … on that very same day within an hour." Six months after Durham's passing, Gaga posted a tribute video to her YouTube page (screenshot above) with the caption, "Not a day goes by that I don't miss you."